After several recent decades of war and political upheaval, Colombia has emerged as a thriving country boasting a beat and energy all of its own. With international visits increasing two-hundred percent since 2006, Tierra de la Sabrosura [land of delicious vibes] — as Colombia is affectionately nicknamed — has become a tourism hub in Latin America. But wait — is Colombia safe? Don’t let negative news coverage keep you at home — savvy travelers know that there are always precautions one should take when traveling to a new country, and this goes for Colombia as well. So, do your research to plan ahead, follow common-sense rules and cautionary advice, and you can enjoy all that this beautiful country has to offer. 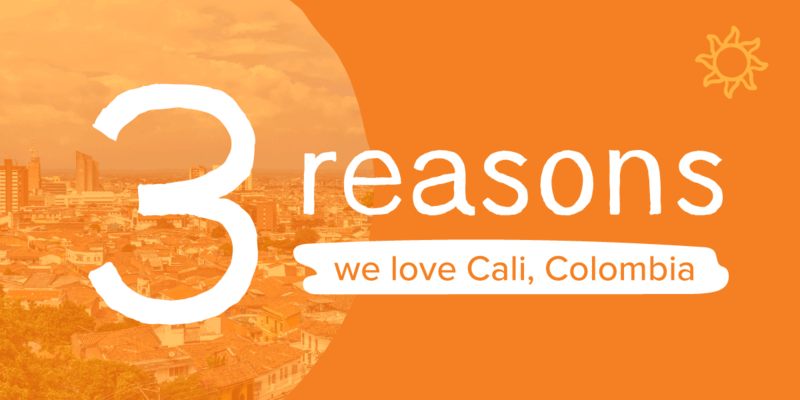 Why we love Cali, Colombia — and you will, too! The sizzling streets, lush forests, sparkling rivers and sabrosura sounds call to the rhythm in all of us, and no spot better exemplifies this than Colombia’s third-largest city — Cali. Here are three reasons why we love this culturally vibrant, historical metropolis. And with good reason. Take a stroll through the city and you’ll feel the energy emanating from the local salsatecas on every corner, pumping music into the streets, while salsa enthusiasts of every age dance from early afternoon into the wee hours of the morning. Cali even has its own style of salsa — salsa Caleña — which combines Caribbean-influenced pachanga, Cuban charanga, and the New York City originated boogaloo, danced to rapid perfection. Home to more salsa schools and teams than anywhere else in the world, Cali hosts the yearly Festival Mundial de Salsa, or the World Salsa Festival, where some 5,000 dancers from the city’s dance schools and academies join dance lovers and music buffs from around the world to compete and celebrate all that is salsa. While nightlife, music, and dance are all a part of what makes Cali so special, we’d be remiss not to mention a few of the many historical locales that adorn Cali’s cityscape. Neo-gothic, Spanish-colonial, and neoclassical architectural influences can be seen in the historic churches Iglesia de la Merced, Iglesia de la Ermita, and Iglesia de San Francisco, while the modest Iglesia de San Antonio of ‘Old Cali’ — once frequented by writers, artists, and musicians — remains a community gathering spot. The historical Plaza de Caicedo is at the heart of the city, and across from the Plaza stands the San Pedro Cathedral, where the culturally-blended paintings of the Quito School tradition are on display. Another great aspect of Cali is, of course, the people. As the third-largest city in Colombia, Caleño culture comes from a mixture of Indigenous, African, and Spanish heritages. Colombia is an ethnically and linguistically diverse country, and you can see this aspect of the culture celebrated through the various festivals and events held in Cali throughout the year. Feria de Cali celebrates cultural and ethnic diversity, along with the city’s historical love affair with salsa, through electrifying parades, local and international dance shows, circus performances, and more. The Petronio Alvarez Music Festival celebrates Cali’s Afro-Colombian roots, attracting musicians from around the world to uplift the musical tradition of Colombia’s African descendants. With such a vibrant mix of cultures and communities, we are proud that Mango Inglés calls Cali home. And soon, through Mango Inglés, communities across Latin America will have access to Mango’s English for Spanish (Latin American) speakers course. Stay in the loop by following @MangoIngles on your social channels, where they’ll be hosting contests, competitions, and giveaways. Interested in learning more about Latin American cultures? Check out our Spanish (Latin American) course, packed full of cultural tips and grammar notes for every stage of your language journey. Or, jump back in where you last left off in your Mango learning. What Latin American cities are on your bucket list? Post them in the comments below!